Download Blair Witch in Digital HD from the iTunes store. Blair Witch images are © Lionsgate. All Rights Reserved. In 1999 The Blair Witch Project changed the face of horror movies and became an instant classic. With it's "shaky cam", documentary style filmmaking it opened up a new way of looking at horror. It intrigued us and fascinated us and scared the living daylights out of us. In 2016 Lionsgate reimagined the film releasing Blair Witch with as much fanfare and hoopla as is befitting the San Diego Comic-Con crowd. The story is similar to the original so the content hasn't changed all that much. In 1999 three college kids went into the woods but never came back. One of those students was James' (James Allen McCune; Shameless) sister and he and his friends go to those same woods to try and figure out what happened. Encouraged by the aid of a few locals things turn ugly when they are visited by an evil presence. Eventually, the legend is actually real and even more dark and menacing than they could have ever imagined. Blair Witch isn't really a sequel to the original but more of a regurgitation of the first story meant for a newer audience. Having heard of the first film those too young to remember it are the target audience and Lionsgate hoped to cash in on the popularity of its predecessor. While I'm sure they did obtain that goal, the film itself doesn't live up to The Blair Witch Project. The cast is a group of hopeful, young, up and coming Hollywood actors. McCune is the best of the bunch but Callie Hernandez (Machete Kills), Corbin Reid (How To Get Away With Murder), Brandon Scott, Wes Robinson and Valorie Curry (House of Lies) offer some decent moments as well. It is obvious though that none of these individuals are major players in movies yet. The Blu-ray is presented in 1080p High Definition video with an aspect ratio of 1.85:1. The quality is grainy but it is meant to be that way in order to give it that "prosumer" look. It gives the impression of store bought cameras used by the students as if it was an amateur documentary. The Dolby Atmos audio is actually one of the highlights of the film as it allowed the filmmakers to make use of the lower octaves to give an undertone of a mild rumbling hum while also effectively utilizing the natural effects and sounds surrounding the actors. While there are only three extras on the Blu-ray one is an hour and forty-six minutes long and is broken down into six parts. 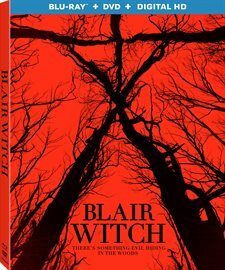 This feature entitled Never-ending Night: The Making of Blair Witch discusses almost every aspect of the making of the film including interviews with the cast, the director, and the creative team. The other extras are audio commentary with the director Adam Wingard (The Guest) and the writer Simon Barret (The Guest) of the film and House of Horrors: Exploring the Set, which looks at the haunted house in the film. If you are a fan of the original then you should definitely see this second film or you will forever feel like you are missing out on something. However, as neither a fan of the Horror movie genre nor the "shaky cam" filming I didn't particularly enjoy the movie. There are some great moments that do scare you and make you jump but if you don't love that type of thing like me) then this is not the movie for you. As a side note, Lionsgate had one of the best marketing campaigns for a film I have seen in a long time. As mentioned above, the film first screened at Comic-con and was originally entitled The Woods. However when audiences left the theater after the screening all the movie posters had been changed to Blair Witch. This hype created some great advanced buzz for the film and I commend whoever came up with the idea. If you are fan of horror films, Adam Wingard, or The Blair Witch Project, you want to consider getting this title for your collection.